Begin your trip at Bethel Woods Center for the Arts in Bethel, located at the site of the historic 1969 Woodstock Festival. The Center offers a variety of performances by nationally renowned classical, rock, country, pop and jazz artists (check schedule.) Enjoy the multimedia telling of the story of the 1960s and the Festival at the Museum at Bethel Woods. 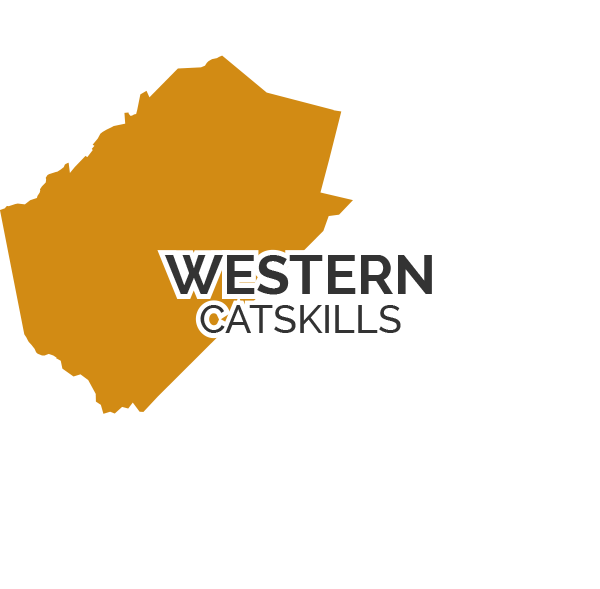 Take Route 17B west to Callicoon. Visit the Apple Pond Farm & Renewable Energy Education Center an organic horse-powered and renewable energy farm featuring tours, wagon rides, farm vacations, and more. 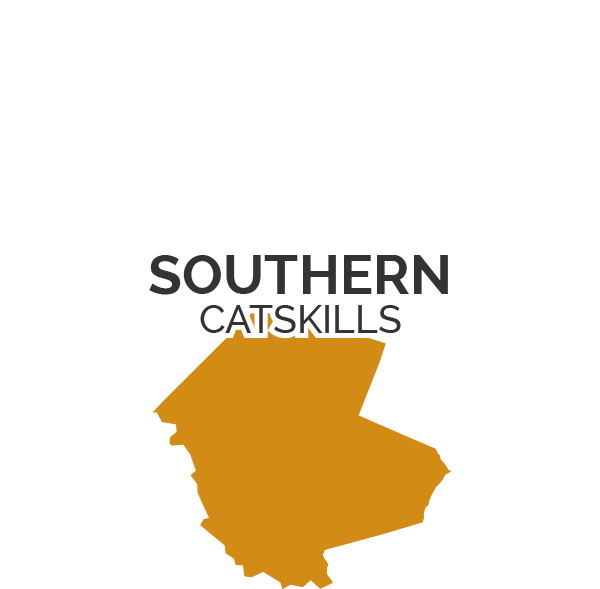 From Callicoon, take Route 97, the Upper Delaware Scenic Byway beautiful viewscapes, and runs along the Delaware River. Follow into the Village of Hancock where you can stop for a bite and beverage at the Hancock House Hotel. From Hancock, take Route 17 East, to East Branch, where you will turn onto Scenic Highway North, following along the East Branch of the Delaware River to the Village of Downsville. Here you can chose to stop, take a leisurely canoe or kayak ride from Al's Sport Store and stay over at the Downsville Motel or just continue along the shores of the scenic Pepacton Reservoir. Follow Route 30 North into Margaretville and eventually ending up in the Town of Roxbury, where you can dine at the Public Lounge with seriously fun cocktails and captivating video screens. Overnight at The Roxbury, a "boutique motel" offering an innovative contemporary twist on the usual country lodging experience. 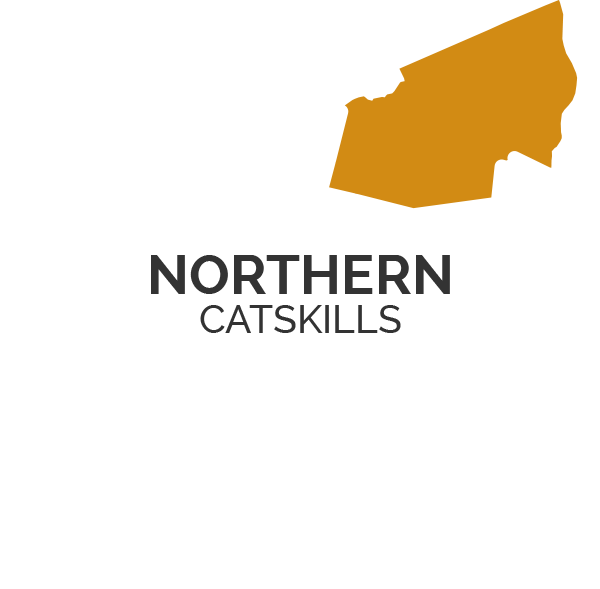 Have breakfast in Roxbury, take stroll through Kirkside Park – summer destination of the Gould dynasty, or visit John Burroughs Memorial Field & Woodchuck Lodge or take a bike ride or stroll on the Catskill Scenic Rail Trail or horseback ride at Stone Tavern Farm . Not that outdoorsy? Head back down Route 30 to Margaretville and along Route 28 to the town of Arkville, where you'll have plenty of breakfast choices including dining at the Arkville Bread and Breakfast! Shop in Main Street shops or antique stores. 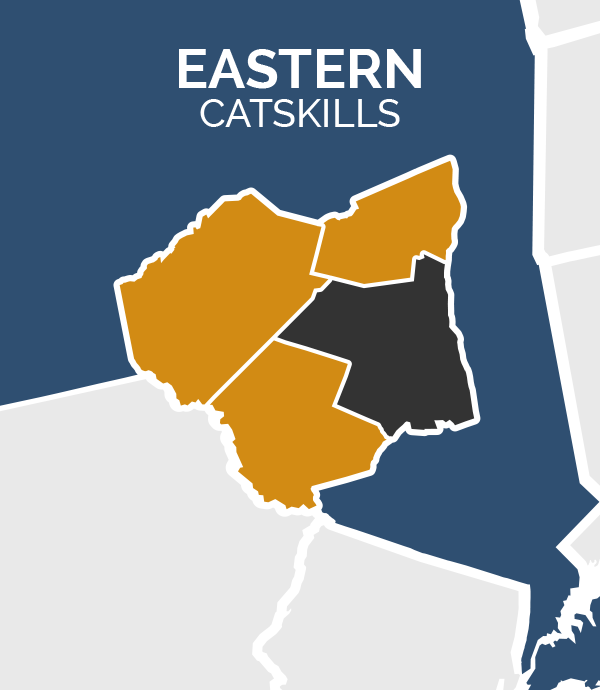 If you're into a little more shopping, head a further east on Route 28 to Mount Tremper and The Emerson Country Store at Emerson Resort & Spa. Browse country shops in a renovated 1841 barn and view colors of a different nature through the "world's largest kaleidoscope." Take Route 28 east to Route 42 north to Route 23A east into the town of Hunter. Have lunch at Bear Creek Restaurant & Recreational Park and enjoy spectacular mountain views while playing miniature golf. Make sure to take the scenic chairlift ride to the top of Hunter Mountain. Continue east on Route 23A. Just after the town of Haines Falls look for signs and a parking area for Kaaterskill Falls. Take a challenging one-mile round-trip hike to see the highest two-tiered waterfall in New York State. 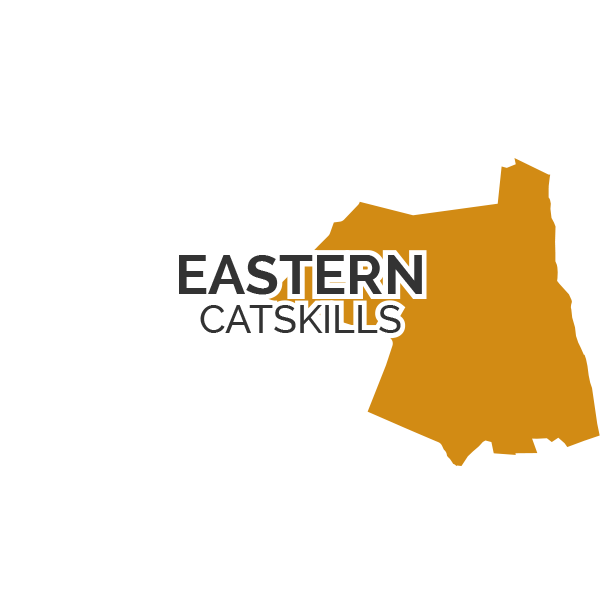 Continue east on Route 23A to I-87, the NYS Thruway, and head south to Kingston. Dine at The Armadillo Bar and Grill, with its Southwestern cuisine. Overnight in Kingston. Visit the Old Dutch Church, first built in 1659 and rebuilt in the 1700s. The site contains the grave of George Clinton, New York's colonial governor from 1743 to 1753. Next, visit the Hudson River Maritime Museum, the only museum in New York State exclusively dedicated to preserving the maritime heritage of the Hudson River. Stroll through the old boat shop; after, visit the historic 1913 Rondout Lighthouse. 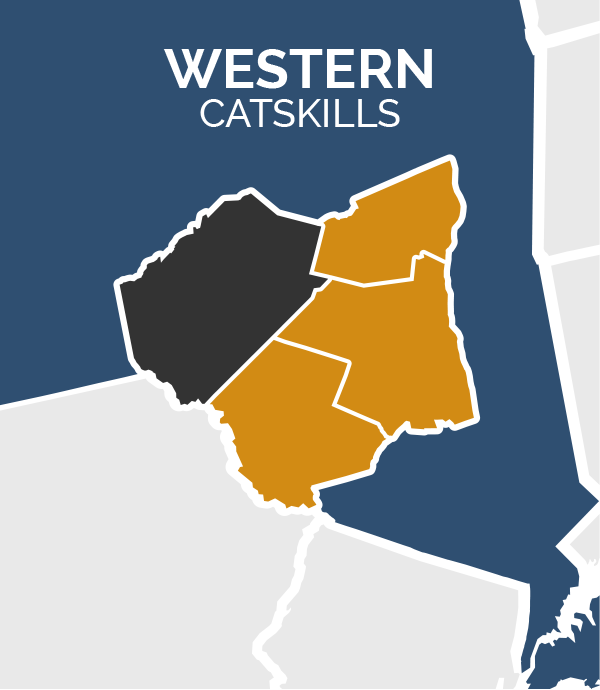 Take Route 28 west and Route 375 north into Woodstock. Visit the Woodstock Guild/Byrdcliffe Art Colony possibly the oldest continuously operating arts and crafts colony in the nation. If you're more adventurous, hike to the top of the fire tower on Overlook Mountain and see Woodstock below, the surrounding Catskill Mountains, the Hudson River, and even the Berkshire Mountains. Lunch at Woodstock's organic Garden Café on the Green, or Joshua's, or just stroll the streets, galleries and shops of Woodstock. Perhaps enjoy a streamside or fireside meal at the Bear Café. 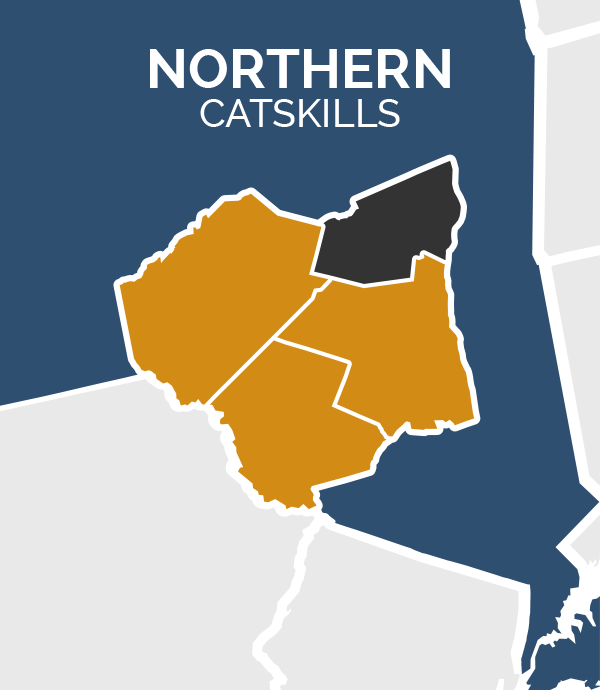 Discover more great travel ideas for the different counties that make up the Catskills.